Walter (Killer) Kowalski, a vegetarian for 50 years and one of the biggest stars in the history of pro wrestling, died yesterday at 81. Back in the day when TVs were large and usually black and white (at least in my house) and there were about five or six channels at most to choose from I spent many a Saturday afternoon watching the Killer, Haystack Calhoun, Andre the Giant and co. battling it out. 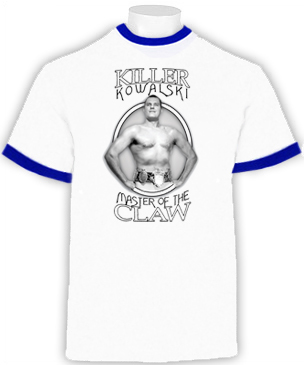 At 6 feet 7 inches and 275 pounds or so, Kowalski was a formidable figure who delighted in applying his Claw hold, a thumb squeeze to an opponent’s solar plexus, when he wasn’t leaping from the top strand of the ropes and descending on his foe’s chest. Read the rest of the obit for many more wonderful facts, including how he went from Tarzan to Killer. Mr. K founded and later sold a professional wrestling school, now known as the Chaotic Training Center in North Andover, MA. Services are this Wednesday in Malden, MA. I wonder if I can talk the visiting SSG Big Brother CollateralDamage into going?